Views to the east from the upper level of the viewing deck at Sankofa Park, located where Crenshaw Blvd. and Leimert Blvd. split. Rendering courtesy of Perkins+Will. 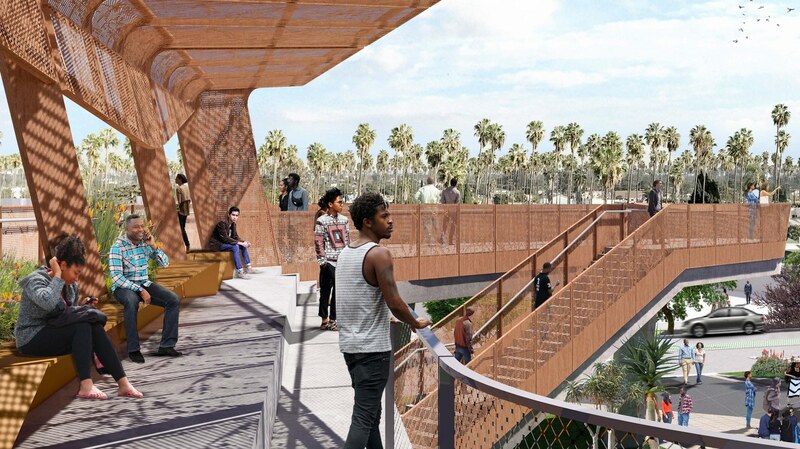 In South LA’s Crenshaw District, a 1.3 mile public art project promises to honor a neighborhood’s history -- and stand against the threat of gentrification, as the train rolls in. As LA’s awards season gets underway so does its art season. The LA Times’ Deborah Vankin explains a packed calendar of art fairs and how they mesh with Tinseltown, as well as a changing and expanding museum scene.